It is difficult now to believe that Auburn was once the largest city in Eastern Oregon and the Baker County seat. Gold was located near there in 1861 and a town of 5,000 sprang up about seven miles southwest of Baker, complete with its own post office. Historian Doug Dornhecker says that a congregation of believers reported from near Auburn in 1877, long after the gold rush was over. They signed in as the "Webfoot" congregation. That name is from local Webfoot Creek. When Judge Thomas A. McBride was publically reviewing his life in a speech, he said that he had gone to the mines and had lived in Auburn in 1863. He may have been a part of this group. The Oregonian, November 13, 1922. "Early Days in Oregon -- Judge McBride Recalls Long Oregon Career." Today Auburn is gone, except for the cemetery. There are no buildings and few clues about the bygone era. The 1870 census may be read online. Historians dispute the points that Halfway was halfway between, but our sources say the town was layed out halfway between Langrel (now Jimtown) and Pine Town (other sources say Cornucopia and Sparta). Before Halfway was platted, four or five Christian families met under a tree above Langrel. A gospel meeting was then held at the Pine Schoolhouse by T. F. Campbell of Monmouth. Several were converted to Christ, but some in Pine Town oppposed the building of a church in their community. The Alexander Stalker family was developing Halfway and offered the emerging church property in their new town. The offer was accepted making the Christian Church the first church of any kind in Halfway. There is a profile of T. F. Campbell. The church first met in the newly built IOOF Hall in Halfway, then a church building was constructed in 1891. The first preacher of record was Richard Boyles. Mr. Boyles had formerly served as minister at Grass Valley and Colusa in California. Grandfather was a conservative thinker and didn't feel that it was apppropriate for the only person who could play the piano was a gentleman who played for the dances on Saturday night, so the church began as a non-instrumental Church of Christ. Grandfather gathered donations to buy the bell that hung in the church belfry. This bell was also used as the firebell. When the clapper struck the bell rapidly, the volunteer firemen knew there was a fire. Grandfather Boyles served as minister of the Christian Church in Halfway for 3 years. In 1895 P. J. Taylor conducted a gospel meeting where 45 were added to the body, 36 by immersion. Elders were appointed including Ellis and Selby Leep. The name that keeps coming up in the history of the Halfway Christian Church is Ellis Leep. In his younger years, he was a major force in getting material on hand and doing the carpenter work for the construction of the building. While well into his 80's, he would walk more than a mile on Sunday morning to build a fire in the wood stove at the building. In fact, much of the story here came indirectly from him. Charter members included Richard Haynie Boyles and Delora Boyles, Paul Boyles, Gertrude Boyles, Grace Boyles, John Denny, Mr. Foster, Ellis Leep, Selby Leep, A.W. Motleys and Alvin Tarter. The church is remembered for the good works, especially of the women. They made clothes, quilts and other items for the needy and for missions. The minister of the church from 1930 -1935 was Clarence A. Boulton, a friend of this writer. The building was closed in 1965 after many years of service. While the Bread of Life is no longer served, the building works well as a restaurant and art gallery. It has been painted red and incorporated into the Pine Valley Lodge. For a view of Halfway as it is right now, click on the webcam. The town, just 10 miles west of the Idaho State line, was platted by William R. Usher. He drew the name from the rich soil in the vicinity. According to historian Clarence Swander, the church came into being in 1895. But a Church of Christ may have been there earlier. The October 18th, 1877 Pacific Christian Messenger says under Personals: "Bro. Pollard of Saratoga has gone to Richland to preach for the church in that place." It was originally known as The Church of Christ of Eagle Valley. 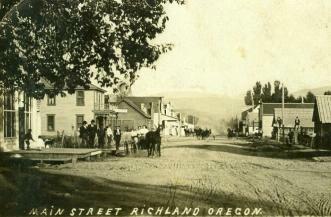 The name was changed to The Christian Church of Richland. A 100' x 75' parcel was purchased at the northeast corner of Walnut and Second Street. Church Trustees for that 1898 transaction were William Chandler, James Holcomb and Robert B. Gibson. drawn by a member at the time. At right is a sketch of the first building. It was probably built about 1900. It has eight sides. Because the mortgage on the second building is described as for "improving" the building, it may be that the original building was incorporated into the later building (1918) and a basement was added in the 1920s. A view commonly held in those years was that basement space is "free." Funds for the second stage of building development were borrowed from the American Christian Missionary Society in 1918 and paid back to its successor, the United Christian Missionary Society, in 1925. Our special thanks to Velma Stewart for her research on this congregation. 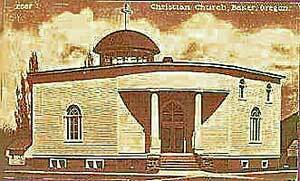 The Baker City Christian Church was established in 1899 according to C.F. Swander. Like many, it had to be restarted and this happened in 1909 and the congregation has continued since. The original building appears on a 1911 map and was located on the northeast corner of Church Street and 4th. The building had electric lights and was located next to a hay shed on its north side. Claiming the Baker City Christian Church as his home congregation is Lloyd Newton, longtime gospel preacher in Oregon, Washington and Utah. Ralph Holcomb is listed in the History of Baker County and honored for his service to God. Baker City and County were named for London-born Edward Dickinson Baker, a Disciple minister. E.D. 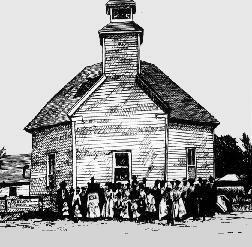 Baker had been converted to Christ at the Carrolton Church in Greene County, Illinois. That church had been established by Barton W. Stone in 1832. Later he is listed as a member of the Springfield, Illinois, First Christian Church. Baker held many roles. He defeated Abraham Lincoln in a primary election in 1842. Baker and Lincoln were friends and the Lincolns named their second son Edward Baker Lincoln in honor of E. D. Baker. He came to Oregon in 1860 and campaigned for Lincoln. Later, becoming United States senator from Oregon, Baker introduced Lincoln at his first inaugural. Lincoln's biographer wrote, "Baker and his wife belonged to that numerous and powerful sect which has several times played so important a part in Western politics - the Disciples." It does not appear that Baker took active leadership in the churches after coming to Oregon (1859) and entering local politics. Mr. Baker's statue stands in the Capitol Rotunda in Washington, D.C. The Baker Christian Church built at 2104 4th Street. That is at the corner of 4th and Church, the northeast corner of the intersection. There was a church parsonage at 2104� 4th Street near the rear of the church property. Pioneer Reminders: The Baker City name, County Name, Baker High School, Baker Middle School. Other Baker County Pioneer congregations include New Bridge (1899) and Pleasant Valley (1900).